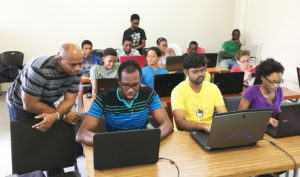 In order to help the Caribbean catch up with other developed countries, beginning in January 2018, the Caribbean Science Foundation (CSF), Scotiabank, and the U.S. Embassy in Barbados, the Eastern Caribbean, and the OECS partnered to launch a set of computer coding workshops in Barbados and the Eastern Caribbean. The pilot workshop ran in Barbados ran on Saturday mornings from January 6 to March 31, 2018. The Workshop will now be replicated in St. Lucia owing to a new grant from the U.S. Embassy in Barbados, the Eastern Caribbean, and the OECS. The goals of the CSF Computer Coding Workshops are to: (1) help address the challenge of increasing the low numbers of skilled ICT workers in the Region, (2) stimulate more interest in science and engineering careers, (3) help train the technology workforce of the future (especially retraining of retrenched workers), (4) stimulate more technology-based entrepreneurship by encouraging the formation of more globally competitive ICT companies, (5) help get more students interested in going beyond programming into the field of computer science, and (6) help prepare students for university study in the STEM disciplines. These goals are consistent with the overall CSF goals of helping to diversify the economies of the Region and thereby raise the standard of living of the people. Thus, CSF projects have a long-term focus on stimulating more technology-based entrepreneurship, and grooming the next generation of Caribbean science and engineering leaders. Because of limited resources, total enrollment in the 2019 pilot Workshops will be limited to about 20 participants per session. Applicants must be Caribbean citizens. Persons less than 15 years old on January 1, 2019 are not eligible to apply to the January Coding Workshops. Similarly, persons less than 15 years old on September 1, 2019 are not eligible to apply to the September Coding Workshops. Girls are especially invited to apply. Other targeted applicants are: (1) retrenched workers, (2) out-of-school and at-risk youth, and (3) disabled individuals, and (4) secondary school science and mathematics teachers. Only candidates who are serious about computer programming and/or computer science should apply, as these workshops are mathematically rigorous and homework will be assigned each week. These are not camps where children come predominantly to have fun, but serious fast-paced workshops. Candidates who are not prepared to do homework and some learning on their own (or in teams) should not apply, as they will probably not be able to keep up with the class. Playing of video games, social media interaction, Website browsing unrelated to the Workshop, and other distracting or disruptive activity while at the Workshop may result in expulsion. Please note that Workshop participants are expected to bring their own computers (that meet our minimum specifications) to the workshop, as the CSF is unable to provide computers. In the Spring of 2019 the CSF Computer Coding Workshop St. Lucia will meet at the Castries Comprehensive Secondary School from 9:00 am to noon every Saturday beginning January 12, and concluding on March 30, 2019 with a public showcase by the participants. The Level I Workshops will focus on html and mobile Apps. The first half of the syllabus will develop basic coding skills. In the second half, the participants will form teams, and the teams will focus on the development of simple Websites and mobile Apps that address specific problems of interest to the teams. Level IA covers html only (website creation and development from scratch). Level IB focuses on mobile apps, but intermediate knowledge of html is required. A preliminary syllabus for the Levels IA and IB Workshops is shown below. Topics in this syllabus are subject to change at any time. The participant application period opens on November 15 and closes on Dec 15. Please note that the same basic application form is used for both the Barbados and the St. Lucia Workshops. Please check the appropriate box for your country at the top of the application form. Also note that there are 4 sections to the application. All applicants must complete Section 0, sign it and return it by e-mail to the CSF, in addition to submitting the Web-based remaining Sections 1-3. Applications without Section 0 will be rejected. When submitting Section 0, please name your attachment to reflect its contents. We suggest you name your attachments using the following format “2019 CCW application-your country-your first name-your last name-section 0”. Attachments with file names such as “scan 001” could cause your attachment to be misfiled. If this happens your application will be deemed incomplete. CCW Participant Web-Based Application Form – Sections 1-3 only. Applications without Section 0 will be rejected. The participant workshop fee of EC$200 helps to offset the costs of running the workshops. For participants who are unable to pay in full at the beginning of the workshop, arrangements can be made for weekly or monthly payments. A workshop T-shirt and snacks are included in this fee. In the near future we hope to run a level II Python-based workshop. For Level II Instructor applicants, facility with Python is expected. Level II Instructors will be expected to have some experience with the application of coding to video games, programming Raspberry Pis and micro-controllers for the control of machines (robots, drones, appliances, and the Internet of Things) as well as to the processing of big data using machine learning algorithms. Instructor application period closes on November 21, and in-person interviews will be scheduled for November 22nd and 23rd. The completed forms should be e-mailed back to the CSF headquarters along with the other requested documents. Our needs vary with time, as we add more sections and more Workshop levels, so we can keep your application on file if a position is not immediately available. Key operating partners of the CSF are the Barbados Campus of the University of the West Indies (UWI), and the Caribbean Examinations Council (CXC).